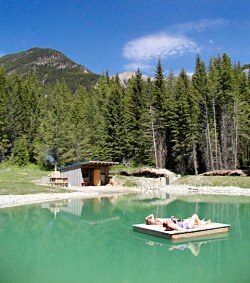 Welcome to Nipika Mountain Resort, near Invermere, in the British Columbia Rockies, Canada. 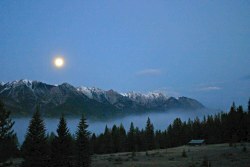 Welcome to Nipika Mountain Resort, near Invermere, in the spectacular British Columbia Rockies. Come enjoy the splendour of Canada's most spectacular wilderness. and Mount Assiniboine and Height of the Rockies Provincial Parks are right next door. 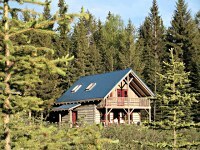 At Nipika Mountain Resort you'll stay in luxurious hand-built log cabins. All our accommodations are well appointed, with full kitchens, baths, fireplaces, and are situated right on the trail system. Our goal is to offer a resort for outdoor enthusiasts which is luxurious, energy efficient, and complementary to our spectacular setting. Nipika specializes in maintaining harmony with the surrounding environment, and as such, we emphasis self propelled recreation --- cross country ski, mountain bike, hike or run on our endless trails that lead right out the front door. Other recreational activities also include fishing, canoeing, kayaking, or rafting the Kootenay River. Enjoy the peace, quite, and serenity too as you sit on the porch and watch wildlife graze in the meadow. We would like to invite you to join us for a vacation you will never forget! Nipika is a place to make friends, get away from the grind, and kick back into a relaxed routine in a beautiful place.